Ammonia emissions – ammonia released into the atmosphere in high concentrations pollute the air we breathe and represent a significant threat to human health and the environment. It is time to act. The EU has already put in place measures to control air pollution and improve ambient air quality. 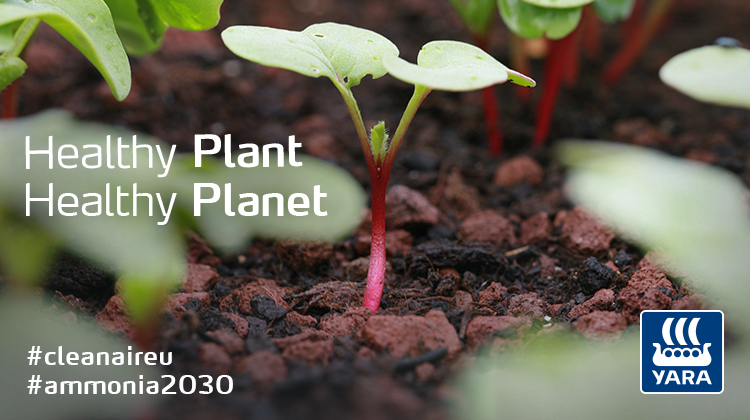 This includes the target of reducing ammonia emissions by 21% by 2030. Furthermore, in 2016, the National Emissions Ceiling (NEC) Directive set reduction targets by country. The reductions need to be achieved by the milestones of 2020 and 2030. Farmers and the fertilizer industry have their part to play in reaching this ambitious target. Agriculture itself accounts for 94% of ammonia emissions in the EU, although of that total, livestock produces around three quarters of ammonia emissions and nitrogen fertilizer only contributes about a quarter. Even so, there is plenty that we can do to help reduce emissions further: by looking at the type of fertilizer we use and how and when we use it. Do we need to be concerned about ammonia emissions? The main concern has to do with human health, when high concentrations of ammonia occur in the air we breathe. By combining with other air pollutants, such as sulfu­ric acid and nitric acid, forming secondary particulate matter, ammonia emissions in high concentrations contribute to respiratory diseases. Air pollution travels a long way and its effects impact the most vulnerable in our society. Ammonia occurs in essential biological processes and is not a problem in low concentrations. This gas is simply a compound of nitrogen and hydrogen. It is commonly found in nature, in fact the human body makes it in breaking down some foods. In the environment, ammonia is part of the nitrogen cycle and produced in soil from bacterial processes. It is also produced from decomposition of organic matter. Reducing ammonia emissions by 10% would mean a saving of at least 6bn euros in health costs[i]. Tackling the causes of air pollution linked to ammonia emissions is, therefore, a “no brainer”—it will improve health, quality of life, and save public funds. It is important that the entire food production industry collaborates to support mitigating actions to avoid ammonia emissions to create a more sustainable agricultural industry. Fertilizer replenishes nutrients removed by the harvest or introduces nutrients not present in sufficient quantities within the soil to grow economically viable crop yields. Fertilizer is good for soil and good for plants. To put it simply, fertilizer is food for plants! It nourishes them and helps them thrive in order to make more food for us all to eat. This is not just a question of efficiency and bottom lines, using fertilizer is also a matter of providing enough crop to feed our growing population. Around the world, 800 million people go hungry. Food security—providing enough food for all in a sustainable way—can be achieved through the responsible use of fertilizer without jeopardizing our environment, health and the quality of the land. The choice of nitrogen fertilizer used can have a different effect on biodiversity and the environment. A simple switch in the type of nitrogen fertilizer we use to grow crops can make a significant difference. Nitrate-based fertilizers release less ammonia into the air. In fact, research done by the United Nations shows that ammonia nitrate emits 90% less ammonia than urea-based fertilizers. A simple switch from urea-based fertilizers to nitrate-based ones in Europe would mean a 10% reduction in ammonia emissions. As well as applying fertilizers, which leads to less ammonia emissions, there are other ways we can impact how much ammonia gets released into the atmosphere. Exactly how and when fertilizer is applied is very important. Incorporation of the product into the soil upon spreading reduces potential volatilisation losses significantly. How deep the product is injected into the soil, as well as the soil’s texture, also play a part in the volatilisation. There are other factors that impact how much ammonia is released into the atmosphere: for example weather conditions such as high winds and a lack of rainfall lead to higher volatilization losses. Rainfall immediately after surface applied urea application significantly reduces ammonia losses. It is clear that the best way, time and manner of fertilizer application is not straightforward. That is why Yara has developed the knowledge, along with the technology, to help farmers apply the best type of product in the best way—both for the soil, the plants, and the air. But the onus should not all be on farmers and the industry. The evidence is clear and policymakers now need to stand up to the challenge that has been set. We call for regulation which would support ammonia emissions reduction. Yara urges the EU and its member states to prioritise more efficient nitrate-based fertilizer. Governments and regulators can also help promote the adoption of responsible, modern farming techniques, which will lead to both lower emissions and also to higher yields. Agriculture can have a much lower impact on emissions and help us to reach the target of cleaner air for us all to breathe.